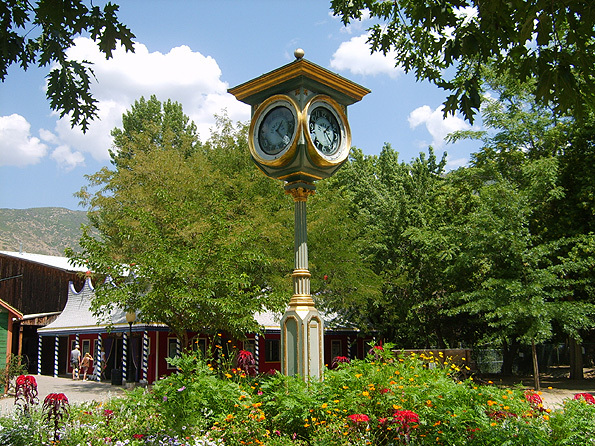 At the south end of Main Street in Pioneer Village stands a large antique clock. Unlike other attractions in Pioneer Village, it lacks any accompanying informational signage, but its history shows it is authentic and one of many preserved treasures at Lagoon. The bulk of Pioneer Village was acquired from the collection of Horace Sorenson, but Lagoon has also procured some artifacts of its own. 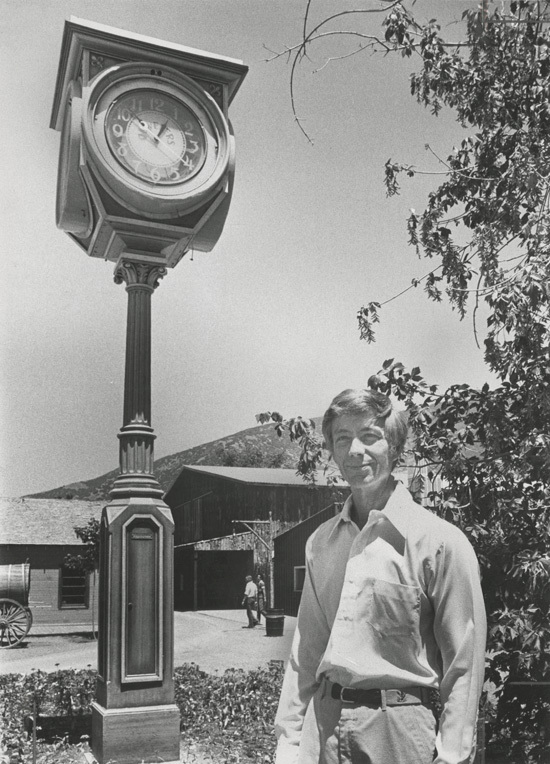 One example is this old street clock relocated in 1977 from Main Street and 300 South in Salt Lake City. Throughout much of the 1800s, street clocks were manufactured in the Eastern states and were costly to ship, making these clocks a sign of prestige in the West. By the turn of the century, however, street clocks could be found up and down Salt Lake City’s Main Street. The last one from the 19th century still operating in Salt Lake is the Old Zions Bank Clock at Main Street and 100 South. In its early days, water diverted from nearby City Creek drove an underground water wheel that powered the clock. Photo from a 1992 Lagoon brochure. The clock had to be removed by crane. Richard Freed, who had restored several items for Lagoon including the old Engine No. 999 and the band organ used on the Carousel, also worked on the restoration of the clock. One original clock face remained and was used as a pattern to etch three other faces in glass. The original motor, operated by 100-pound lead weights, was removed and displayed in the tool collection. The restored clock now runs on electricity and – when it was first installed at Lagoon – the chimes would ring every 15 minutes. It has been repainted at least a couple of times since it arrived in 1977. Old chime clock makes a timely addition to Pioneer Village decor. Deseret News, 27 Jul 1977. Markosian, Richard. What Lies Beneath Salt Lake City?. UtahStories.com, 26 Aug 2010. 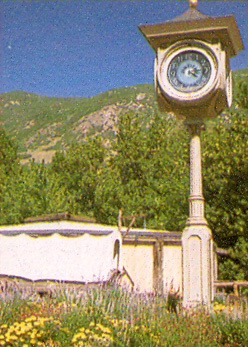 The Old Clock – Last 19th-Century Post Clock in Salt Lake City. Waymarking.com, 6 Sep 2010. Street Clocks!. GreatStreets.org, accessed 22 Mar 2012.